...that Colonel James Ackerson committed treason in attempting to sabotage the SPARTAN-II program? There is more information available on this subject at Personal computer on the English Wikipedia. 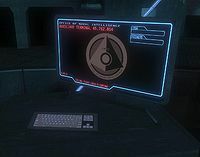 A PC in Dr. Halsey's lab. A Personal computer, often abbreviated as PC, is a self-contained human computer usable by only one person at a time. It may be used as a home computer, or may be found in an office, school, and likely connected to a local network. Halo was originally intended for the Macintosh, as a sequel to Bungie's popular game Marathon: Infinity. However, with the release of the Xbox, and Microsoft's purchase of Bungie Software, the game was scrapped and ported as a first-person shooter on the Xbox. In 2001 however, Bungie along with Gearbox Studios shipped a PC version of Halo which became popular with many PC gamers. However, many were disappointed with the netcode, and people complained that the port was poorly designed, causing lag in online play. Halo PC was created to fix these problems, eventually a program called Halo: Custom Edition followed. Halo 2 was ported to the Windows Vista operating system in 2007, titled Halo 2 Vista. Halo: The Master Chief Collection is to be ported to the PC. A PC screen depicting a battle scene in the process of being digitally edited by Benjamin Giraud to look less gory. A keyboard, with two smaller data devices.